Druk Path Trek is a legendary hiking trip of Bhutan. This is the moderate type of trekking. It means it is fairly easy hiking journey. Druk Path trek grants to experience gorgeous natural landscape with blue pine forests, countryside setting, mountains, glacial lakes, temples, and monasteries. In this trekking, you can have a great view of Mount Chomolhari (Jomolhari), the second highest peak in Bhutan lying at 7,134m which is lying on the northern border with Tibet. Druk Path Trek begins from above the National Museum, Ta Dzong, in Paro. Before the start of the trek, you will be offered guided sightseeing tour in Paro. And you also hike to Tiger’s Nest Monastery which is locally famous in name of Taktsang. The first day’s walk leads to the ruined Jeli Dzong which sits on a high ridge above the Paro Valley. This place commands breathtaking views across to Chomolhari. During the succeeding 4 days of trekking, you hike up above the tree-line and cross several passes. En route you camp beside clear mountain lakes for night halt, visit yak herders encampments and enjoy breathtaking views of Himalayan Peaks to the north at the border with Tibet. 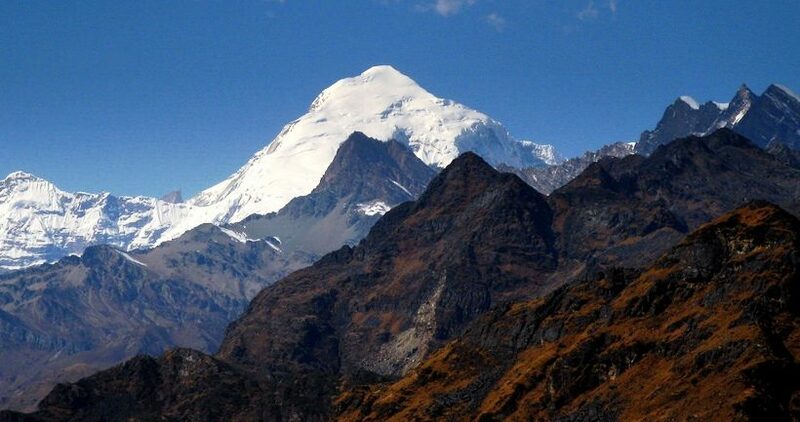 During this trekking, you can also enjoy the view of Mount Jitchu Drake and Mount Gangkar Puensum. On the 8th day, you end this trekking in Thimphu. Thimphu is the capital of Bhutan. Here, you go for visiting Tashichho Dzong: the landmark of Thimphu where are the houses of Government Secretariat, National Assembly and the office of King; Memorial Chorten: the temple was built in the memory of Bhutan’s Third King to whom people remember as the Father of modern Bhutan followed by National Library, Arts & Crafts School. After Thimphu sightseeing, you head towards Paro. Finally, on the 10th day, you depart Bhutan from Paro International Airport taking flight for your onward journey. There are only two Airlines (Druk Air- Royal Bhutan Airline and Bhutan Airlines) which flying in and out of Bhutan. Both airlines have a flight from Kathmandu to Paro. Lots of visitors travel Bhutan via Kathmandu Nepal- the country of Mount Everest with the beautiful Himalayas. Druk Path Trek- 10 days is a standard trip. However, it is possible to be customized to meet your requirements. For any further information and the price of this trip please feel free to contact us. Day 1: Arrival in Bhutan. Highlight: Arrival in Paro International Airport. Meeting and greeting you by our representative and transfer to the hotel. Visit of Ta Dzong (Ancient building which now is the Bhutan’s National Museum has in its possession over 3,000 works of Bhutanese art covering more than 1,500 years of Bhutan’s cultural heritage) and Rinpung Dzong (Fortress built in 1646 by Shabdrung Ngawang Namgyal, the first spiritual and temporal ruler of Bhutan. This Dzong houses the monastic body of Paro, the office of district administrative head and court of Paro district). Day 2: In Paro - Hike to Tiger’s Nest Monastery. Highlight: Early morning drive to the base camp of Tigers’s Nest Monastery (Locally known as Taktsang Monastery is located in the side of cliff of the Upper Paro Valley where Guru Padmasambhava landed on the back of a tigress in the 8th century). Hike up to the monastery. It’s about two hours hike up the cafeteria. From this point, enjoy the spectacular view of the monastery. Hike back to the road. Then visit of Kyichu Lhakhang (One of the oldest and most sacred shrines in Bhutan). Day 3: Trek to Jele Dzong (3450m). Walking 3 to 4 hours. Highlight: Today is beginning of trekking. It starts above the National Museum with climbing up till the camp is reached. On the clear day the Paro valley and the snow-capped mountains can be seen from the trekking trail. The campsite is near the old Jele Dzong which in mostly in ruined condition. Above the camp is Jele-la pass (3,400m) and Jele Dzong (mostly in ruins). There is also a Lhakhang containing a statue of Buddha Sakyamuni. Day 4: Trek to Jangchulakha (3,780m). Walking 4 to 5 hours. Highlight: After breakfast trek starts with a short climb. The trail gets level in the meadow along the ridge for sometime before walking downhill for a while to climb through thick alpine forest to a saddle (3590m). The trek then follows the ridge making many ups and downs along one side of the ridge to the other before arriving at the camp north east at Jangchulakha (3780m). En-route spot or hear some Monal pheasants or if the weather is clear get spectacular view of Mt. Jhomolhari and its range. Day 5: Trek to Jimilangtsho (3,880m) Walking 4 to 5 hours. Highlight: Trek begins with a short steep climb through the Juniper forest starting right from the camp. Once the steep climb is over, the path gets level for a while and it gradually goes up and down through the thicket of dwarf rhododendrons leading to Jangchu La (4180m). Then the trail goes down to the camp at Jimilangtsho Lake (3,880m). The name of this lake means Sand Ox Lake, named for a bull that emerged from the lake and joined the cattle of a family that uses the area as a summer grazing ground. Day 6: Trek to Simkota (4,040m). Walking 4 to 5 hours. Highlight: Start climb through rhododendrons till the trail becomes a little flat to arrive at another lake known as Jahny Tsho. From here the path becomes much wider as it meanders uphill through the dwarf rhododendrons till the summit nearby the camp. This place with lake gets very beautiful when rhododendrons are in full blossom which can be observed while climbing up and looking back at the lake. Day 7: Trek to Phajoding (3,750m). Walking 4 hours. Highlight: Today the trek commences with a gradual climb and if the weather is clear, witness the majestic views of Mt. Gangkar Puensum and other peaks. Then the trail slowly descends through juniper trees to a campsite besides the Phajoding Monastery from where Thimphu town is visible at the valley floor. Day 8: Trek to Thimphu. Walking 3 hours. Highlight: After breakfast start trekking to Thimphu valley following the trail that goes downhill all the way to Thimphu through a forested area of mostly blue pine. In a leisurely pace, Thimphu is reached after 3 hours of walking. Upon arrival at Thimphu, check-in hotel. The rest of the day free for Shopping. Day 9: Sightseeing in Thimphu. Drive to Paro. Highlight: In Thimphu visit to National Memorial Chorten (The stupa built in the memory of Bhutan’s Third King regarded as Father of modern Bhutan), Institute of Traditional Medicine, Folk Heritage Museum, Textile Museum, Tashichho Dzong (The beautiful medieval fortress/monastery), Arts & Crafts School. After sightseeing drive to Paro. Day 10: Departure from Bhutan. Highlight: Our tour officer transfer you to the Paro International Airport in time for your flight and help you to get on board for your onward destinations.